If you have a default boiler or central heating system, contact us for immediate remedy. We conduct elaborate inspection of the system’s control, and conduct a general internal and external maintenance and servicing. We test and repair the appliance in accordance with manufacturer's instructions and standard procedure as laid out. Once on site, our technical team conducts a series of troubleshooting exercise in order to identify the root of the problem. They are Gas Safe registered technicians and are knowledgeable and experienced in executing complex operations. They employ the best methodologies and techniques in probing and developing durable solutions. 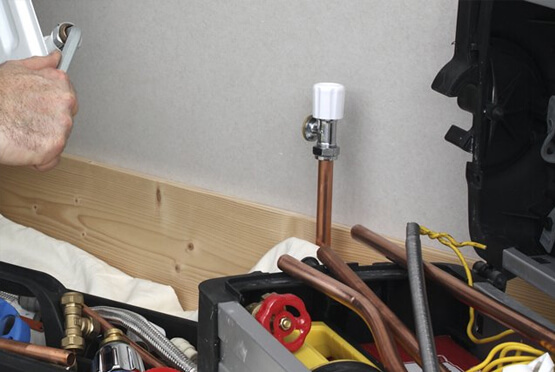 When it comes to intricate processes of repairing the heating system, we are bettered by none. Our competent professionals are trained to tackle: electric heater and heating controls repairs, broken system elements within the apparatus, non-functional thermostats, gas fire problems and boiler and radiator issues. We also specialize in gas and boiler leaks and central heating installation, boiler servicing, boiler repairs, and boiler installation. Defective central heating systems should be treated with urgency. This is meant to identify and curtail any harm that may resort from degeneration of the apparatus. Loss of life or damage to the property can be avoided by regular or annual inspection of the heating system. Our team of engineers are trained to conduct elaborate inspection of the system and controls, and general maintenance and servicing of the apparatus. They test and repair the appliance in accordance with manufacturer's instructions and procedures. We observe all boiler and pressure vessel code of standards as laid down by the relevant regulatory body. In Livingston, Musselburgh, Dalkeith, Leith and Blackford areas our services are available 24/7. This has enabled us to serve you with utmost dedication and love. We respond to your emergencies with unequalled speed. We come to you to correct any faults that you may experience in your heating system. Through use of specialized tools we inspect the boiler, radiators, thermostat or any accessory in one of the system components. Once the source of trouble is pinpointed, our experts move in to ensure that proper functioning is restored and efficiency improved. We are strategically positioned in Edinburgh. We are conveniently placed to enable quick response to your central heating repair emergency. This also eases you in accessing our free consultancy services concerning packages we offer and their service charge. Our incredible reputation is what has kept us running all through these years. Our quality services speak for themselves. We are at the forefront in acquiring the latest technology and techniques in addressing your heating system troubles. Whatever the make and design of the central heating system, whatever the budget constrains you have, come to us for polished central heating repairs service any day of the year.